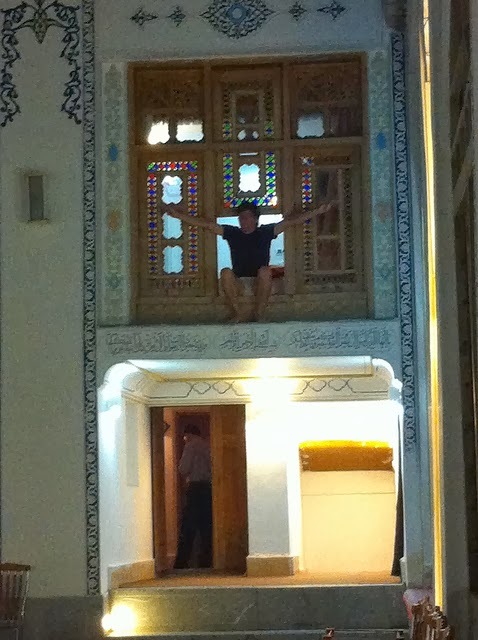 اصفهان: Some Serendipity at our Esfahan Hotel. We stayed at a traditional hotel which was quietly tucked inside a narrow side road where it was at times a challenge to walk as wild motorcyclists as well as cars would clip through thinking it was a race track! Our hotel was quaint and similar to a traditional Persian hotel but more fanciful with a feel of an up scale Ali Baba's palace! Each room had a special character of it's own, and my room was no exception! This was a nice reflecting pool, which is a common feature on many of the traditional Persian hotels we stayed at. I imagine it would be fun to sneak down here in the middle of the night and wade through it without anyone taking notice? My room was above the walk way and much of the walk area throughout was part of my room. ( in the photo below). The wooden windows with coloured glass were very heavy and were a challenge to open. I once opened the window and hung out on the ledge watching my friends on the couch below. This is where we would meet when we were wanted to talk, have tea and enjoy ourselves. It is a large couch with a rug and some pillows, but we nicknamed it the "play pen". We had great fun! 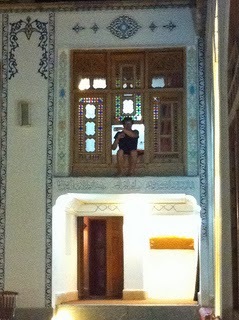 Although Esfahan was rather strict, some fun moments of serendipity happened. Before I arrived in Iran I was chatting on line with some friends of mine in Iran in different cities. I chatted with a guy in Esfahan but we had lost connection for a while. When I was in my hotel room and my Skype turned on, this Esfahan friend came on and we chatted again. He told me that he would meet me outside my hotel as Iranians weren't allowed to meet the guests in that hotel. I met up with him clandestinely on the street corner as he waited for me in his new fancy car. He would fit the classical "pretty boy" image: perfect hair, fashionable clothes, shined shoes, a fancy car and spoke very politely in a soft voice. I must have looked like a scruff straight boy with my clothing which I had worn on my journey in Iran. Anyway, we enjoyed ourselves as he took me away from the city centre and off the path, up into the mountains surrounding Esfahan where the University of Esfahan was near by. Up in the mountains there was a small place to have some tea. I was being noticed and got curious looks by everyone which made me realise that I was definitely "away from the tourist sections". 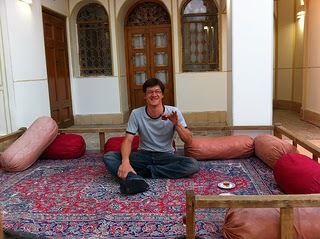 We enjoyed our tea and polite conversation as well as the bird's eye view of Esfahan down below. We continued to walk around and we passed a security check point where a police man with a huge gun stood in a dreamy state. My heart jolted for a moment there as I was an American away from my tour, off the designated itinerary, and without my passport or any ID! I looked away and tried to avoid showing my features as I definitely didn't pass as an Iranian and tourists don't go up to that area. My friend told me not to fear, as "I was with him now". Later we went back for a drive. My friend impressed me by driving fast in a cruising style which I used to do with my friends when I was living in Qatar. 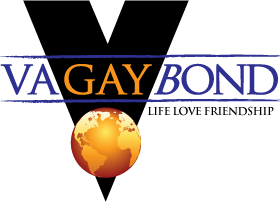 We were driving around looking at all the evening lights, and passing by elegant women and handsome guys who were all decked out with their very fashionable muscle t shirts, and expensive sunglasses, posing and flexing with each other that it resembled a gay area in Europe. It was great fun! Driving me around some more on Esfahan's back streets I saw a glimpse of life which was not seen on the tourist route. He then politely brought me back to my hotel saying that his mother was waiting for him and that he didn't want to worry her as it was already late. This photo below was funny because Esfahan's more conservative dress was a contradiction to this display in the Esfahan bazaar. It was also funny because the conversations we would have with the guys, sitting on our "playpen" would be about chadors in a joking way. I came down from my room with the blanket and sat among them with the blanket wrapped around me, a bit like a chador and joking and laughing. 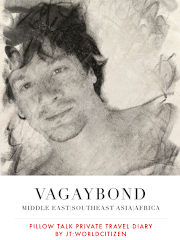 The next morning the female receptionist made a comment about me and one of the handsome Iranian bell boys started to laugh. I realised that, unknown to me, there was a camera in the court yard above our "play pen" and she was watching me wear that chador! Oh well! Just having a little fun. Nothing bad happened from my playful little game.